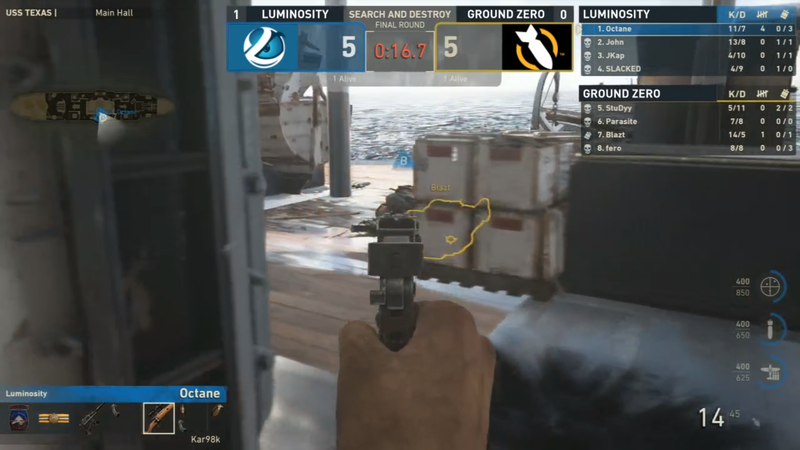 Blazt was the last man alive for Ground Zero during its match against Luminosity at the Call of Duty World League Dallas stop. But while his opponent passed over him once, unnoticed among the dead around the bomb site, a double-check quickly led to a Luminosity win. There’s been some debate over what caused Octane to realize his mistake. The crowd’s audible gasps could have assisted, but while they aren’t playing in soundproof booths, the pros are wearing noise-cancelling headphones. It’s possible they might pick up on the general noise swell, but it’s not like someone was yelling “check the bomb” at the stage either. The other theory is that, since dead teammates can still view the game through their living teammates’ viewpoints, another member of Luminosity could have seen Blazt when Octane didn’t and called it out. I’ll let you be the judge of it, because the only way we could really know for sure either way is through a listen-in on the team’s comms. You can follow the action in Dallas throughout today and tomorrow on the Call of Duty Twitch channel but please, try not to give any more sneaky plays away.